Body Color: Golden yellow, the color of the midday sun. Physique: Average for a mare of her age and profession, though she does her best to keep fit because adventure is demanding! Occupation: Adjunct Professor of Aetherology at Canterlot University, specializing in planar travel and multiversal navigation. Theoretical, of course. Part-time adventurer. 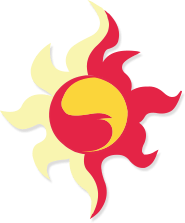 Cutie Mark: A fiery sun with its disc marked by interlocked orange-red and yellow swirls in the approximate shape of a yin yang. Walking Arcane Encyclopedia. What Sunset lacks in raw magical strength she makes up for in quick thinking and such a comprehensive, internalized well of arcane knowledge that she can virtually craft any spell in her head and execute them with surgical precision, aimed at just the right spot for maximal impact. Education Nonpareil. Having grown up in Canterlot to enthusiastic parents and in a climate that demanded academic excellence, Sunset Shimmer is a peerless intellectual. While her primary focus is in planar travel, she has spread her net wide and caught knowledge of many things. If there is anything that could potentially be an academic field, Sunset probably knows of it, or has at least heard of it, even if she is not an expert or direct practitioner. Portal Specialist and Planar Theorist. Sunset’s expertise is in portals and planar travel. Not so much instant teleports, but deploying precise portal entres and exits for traversing hazardous terrain during adventuring or simply getting from one place to another. She is also an expert in deploying and maintaining teleportation circles and assessing artifacts that facilitate teleportation. Sunset Shimmer was always a precocious child. She enjoyed learning, voraciously devouring any book she got her hooves on. The ones that she found the greatest taste for, however, were those of magical practitioning. Some ponies were content with theory, but Sunset wished to put her readings into practice. Her interest in teleportation magic manifested young. Shortly after she had learned to levitate things, she began attempting to send objects across the room without being in between. This resulted in quite a few exploded or lost test objects. But nonetheless, Sunset persevered, eventually creating a small, stable portal entre and exit that she could use to move books and toys across the room. It was here that she earned her cutie mark, emblematic of her burning passion for her art and the balance of magical forces required to make it so. 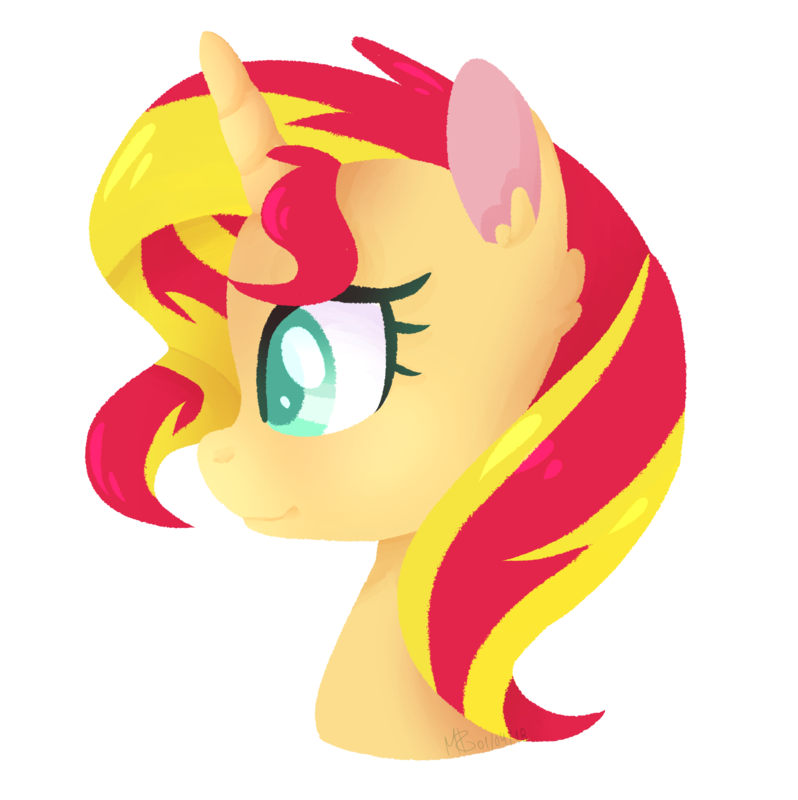 Sunset’s parents enrolled her in the School for Gifted Unicorns where she quickly attracted the attention of Princess Celestia for her talents. Sunset proved to be a veritable prodigy. She received high marks in all academic subjects even while pursuing her own portal project on the side, all under the watchful tutelage of the Princess. Unfortunately, Sunset’s personal pursuits left little time for socializing. Furthermore, Celestia began to notice dire signs in her prized student. Sunset refused to work with other students, even taking on the entirety of group projects solo. Meanwhile she continued with her portal studies without regard to safety of herself or others. Her attitude toward her peers only worsened as the school year wore on, going from aloof to reluctant to outright hostile. She treated Celestia with respect and kindness, but no others. Celestia finally put her hoof down when she caught Sunset skulking through the library’s forbidden texts section. It was clear Sunset’s complete and utter disrespect of others and obsession with improving her portal spell made her unfit for the school, let alone Celestia’s personal protege. Thus it was with heavy heart that Celestia expelled her. Furious and heartbroken at her mentor’s perceived betrayal, Sunset opened a portal and disappeared into it. It is unclear where she ended up or what happened on the other side and even now, Sunset seldom speaks of it. Public knowledge is that Sunset returned to Canterlot with her parents several weeks later. Gone was the precocious, arrogant, temperamental filly. In her place was a much more sober, somber Sunset. Though she never re-entered the School for Gifted Unicorns, Sunset quietly made her way through regular school, eventually graduating with honors from Canterlot University and later taking an adjunct faculty position to continue her portal research. Since the portal incident, Sunset has softened her image, though she is still well known for her sarcasm even in research circles. She can always be counted upon to respond to dangerous situations or unexpected lab results with an exasperated eye roll or wry quip. She is unflappable under extreme stress and level-headed in the face of danger. Despite the mask of the jaded, hard-boiled researcher she wears, Sunset has a soft spot for those who genuinely put forth effort but still struggle. Building her academic career from the ground up when challenged by both her peers and titans of her field before her was no easy task; indeed it was overwhelming at times. She is willing to sit down with students who need a bit of extra help. She has little tolerance for troublemakers and this is perhaps where she gets her frosty reputation. Sunset sees her teaching job as penance for her terrible treatment of her classmates in her youth. But even with most of her time devoted to teaching, a fire for hands on experimentation, research, and adventure still burns within her, the same drive that led her both to her calling and her fall. Given the opportunity, it is conceivable that she might be lured out of her lab and back into adventuring in the wide world of Equestria!